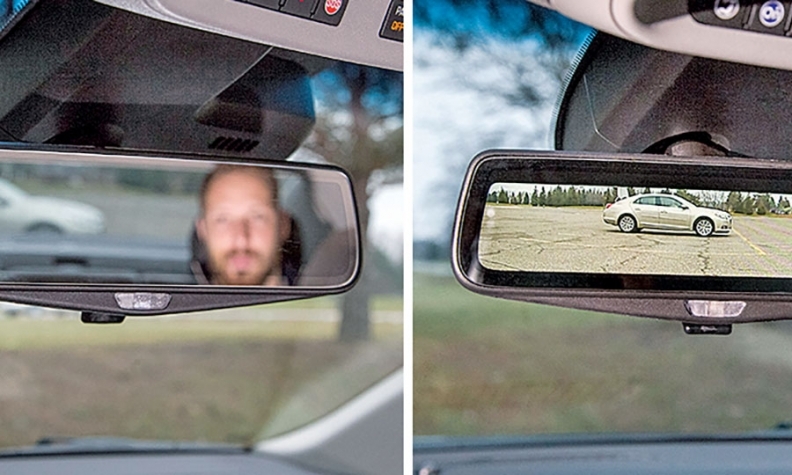 Cadillac's prototype rearview mirror can stream an image from a camera mounted on the vehicle's rear. Drivers return to standard display via a toggle. After a century of duty, the humble rearview mirror is about to get a makeover. Two automakers have introduced rear cameras that feed a video image onto the rearview mirror, eliminating blind spots when the vehicle is going forward. If motorists don't want the video image, they can toggle to a conventional mirror. General Motors offers a Gentex-designed rear display for Cadillac, Buick and Chevrolet. Nissan offers a Panasonic unit in three Japan-market models, and the U.S. will get the rear display on the 2018 Armada SUV, according to IHS Markit. IHS predicts that other automakers soon will follow. It expects global production of 1.8 million panoramic rearview displays by 2025, up from 70,000 this year. "There is a lot of interest across the board," said IHS technology analyst Brian Rhodes. "We see a lot of development in North America and Japan." The biggest benefits would come when cameras replace side mirrors, enabling an aerodynamic upgrade that would improve fuel economy by one or miles per gallon. By 2025, IHS expects annual production of 423,000 side-view camera displays worldwide, although U.S. regulators have not OK'd the elimination of side mirrors. Canada parts giant Magna International has also developed a pair of camera-equipped mirrors that allow drivers to see video of their surroundings as they drive. The ClearView system is designed to help improve visibility while changing lanes, backing out of a parking space or driving with a vehicle full of passengers or cargo. Automakers have asked the U.S. National Highway Traffic Safety Administration to approve that technology, but the agency has not announced a timetable for review. In addition, IHS forecasts 2025 global production of 1.4 million camera-mirror hybrids, which combine a camera with a traditional mirror. In the U.S. market, automakers can install side mirrors with optional video displays, but they can't eliminate the side mirrors. Europe will get the technology first — likely in the next year or two, according to Rhodes. While the industry awaits NHTSA's decision on side mirrors, U.S. consumers are getting their first look at rearview video displays. In 2015, the Cadillac CT6 debuted with an optional rearview mirror display produced by Gentex. Since then, GM has expanded its use to Buick and Chevrolet. Gentex has told investors it expects to produce 500,000 hybrid display mirrors annually for General Motors, Subaru and three other unnamed customers in 2019. In addition, Gentex is marketing a side mirror that can double as a video display. Steve Downing, the company's COO, says automakers can use the same hardware in any major world market. "There are different regulatory requirements in the U.S., Japan, Europe and Korea," Downing said. "We are offering a product that will allow automakers to use one hardware set globally." Gentex has several development projects underway for its hybrid side mirrors but no production contracts, Downing said. Japan currently permits vehicles with no side mirrors, and Europe is expected to follow suit. Those regions would be likely markets for side-mounted camera displays, said Jerrod Brueckner, Panasonic's group manager of automotive electronics sales. At the 2016 Consumer Electronics Show in Las Vegas, BMW displayed an i8 concept with no mirrors. Images from four cameras were stitched into a single video image on a display positioned like a rearview mirror. "We've gotten a lot of good feedback," Brueckner said. "We have some prototypes. At this point, we can produce them in 2020 or 2021, if demand is there." Panasonic and its customers are still figuring out how to display those side video images. The screens could be mounted on the A-pillar, the door, or on the instrument panel. "We are not wedded to any one location," Brueckner said. "Our human-factor teams have been looking at all locations that make sense." Panasonic also is marketing its displays to truckmakers as a substitute for big side mirrors. "We are in discussions with various commercial makers right now," Brueckner said. "There is an appetite and interest in that."